I used to use Dove anti-perspirant every day of my life. Some days multiple times. Sarah, at The Healthy Home Economist sums it up wonderfully. Read her post here. We HAVE to start reading labels!!! Have to! I used Tom's and thought it was time to try a homemade recipe. I owe all the thanks for this recipe to my cousin Lisa (love you and thank you!). I LOVE this recipe and I use it daily!! So, before you make this, I want to make sure you get this. Sweating is good. Stinking is bad. You want to sweat. That is how our body rids itself of the toxins and pesticides we ingest every day. So, you will still sweat. You just won't stink. Get it? Good!!! 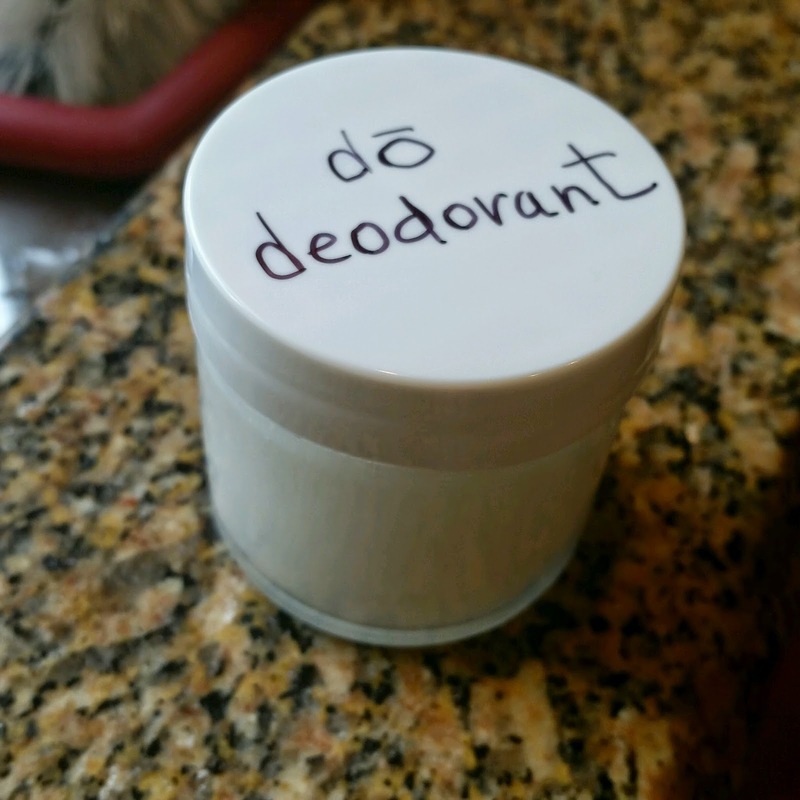 Now go make some good for you/safe deodorant. It will take like a minute!!! It is super easy! Place ingredients in a bowl and use the back of a fork to mash everything up. Transfer to container of choice. I use a butter knife. I use this glass container from Aroma Tools and love it. I just store it under my sink in the bathroom. I use the back of a finger nail, scrape a small amount out of the glass container, flip it around to my finger tips and rub it in my arm pits. You can also clean out an old deodorant tube and put the deodorant in there, but that needs to be stored in the refrigerator. It melts right on and leaves no residue. If any irritation occurs, slightly cut back on the baking soda next time. I have a friend that this happens to in the summer. *I have heard that some baking soda has unwanted ingredients in it. And I know of people who buy Bob's Red Mill only. I could not find anything bad about Arm and Hammer and that is what I had on hand, so that is what I used. If you have any info regarding Arm and Hammer, please share it. I would love to know. **The Melaleuca is a MUST when making this recipe. Melaleuca kills the bacteria that can cause the odor, but too much can be irritating. ~I only recommend, stand behind and use doTERRA essential oils. Keep on striving towards Living GREEN!